Spring break was anything but for the Pitt baseball and softball teams, as both found themselves involved in heated competition over the past week. Both teams found mixed results, the baseball team earning its first conference win of the season and the softball team ending break with a three-game losing streak. The Pitt baseball team found success down south last week as it headed down to Kissimmee, Florida, for the Sunshine State Classic, emerging as victors in all five games played. The Panthers opened the series with a walk-off victory over Massachusetts. The Minutemen tied the game at 2-2 in the ninth, setting the Panthers up for a dramatic finish. First-year outfielder Ron Washington Jr. cracked a double into left field to win the game 3-2 for the Panthers in the bottom of the ninth. 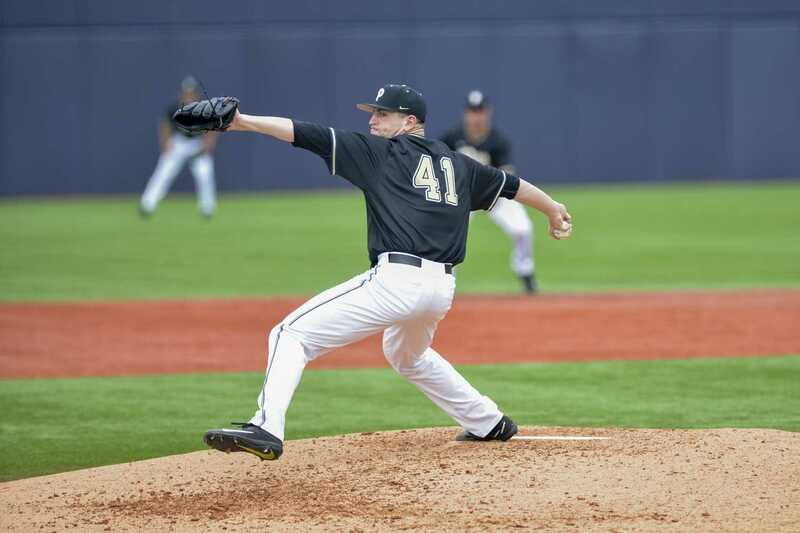 The Panthers then moved on to face undefeated Butler and Massachusetts in a doubleheader. Senior pitcher Matt Pidich led the way with six scoreless innings, and senior infielder Nick Banman knocked a solo homer in the eighth as the Panthers blanked the Bulldogs, 3-0, in the first game. Pitt faced Massachusetts again in the nightcap, this time beating the Minutemen 9-0. Junior starting pitcher Blair Calvo was dominant over four innings, striking out seven while allowing only five hits. Most of the Panthers’ scoring came in the fourth and eighth innings, where they tacked on four runs in each. In the fourth game of the tournament, the Panthers saw some familiar faces as they once again faced Massachusetts, this time beating the Minutemen by a final of 10-5. Pitt started off strong, scoring three runs in the first thanks to runs batted in singles by Banman and redshirt senior outfielder Frank Maldonado. The Panthers kept it going in the sixth inning as two errors by the Minutemen and a sacrifice fly by sophomore infielder David Yanni gave them four more runs and a 10-3 lead. Junior pitcher Yaya Chentouf recorded the save while striking out two in 2/3 innings pitched. The final game of the tournament saw Pitt rout St. Peter’s, 21-1. Redshirt junior infielder Liam Sabino had two homers and four RBIs. Washington Jr., Yanni and redshirt senior infielder Caleb Parry each concluded the day with three hits. After their sweep in Florida, the Panthers moved on to Blacksburg, Virginia, to begin their ACC schedule against Virginia Tech March 9-10. Pitt began the series with a 4-1 loss, as costly errors allowed Virginia Tech to score four unearned runs. The Panthers’ only tally against the Hokies came in the third as junior outfielder Connor Perry walked and stole second before scoring on a single from sophomore infielder Alex Amos. The Panthers concluded the series in Virginia with a doubleheader the next day against the Hokies. The Panthers split the doubleheader, losing the first game 3-1 and claiming their first ACC victory of the season in the second, winning 15-10. The Panthers are back in action as they host Youngstown State Tuesday at 3 p.m. at the Charles L. Cost field. The Pitt softball team had a loaded schedule over spring break as it headed south to warmer weather for ten games. Pitt started off with three games in Raleigh, North Carolina, at NC State. The Panthers were shut out in the first game, dropping a 7-0 contest to the Wolfpack. The second game of the series saw the Panthers beat the Wolfpack with a score of 9-1. Senior infielder McKayla Taylor was perfect in the batter’s box, going 3-of-3 with a three-run blast and four RBIs on the game. The Panthers wrapped up the series in Raleigh by winning the final game 7-5 over the Wolfpack to secure a series victory. Taylor continued her hot streak as she recorded three singles in her first three at-bats, while junior outfielder Taylor Myers had two hits and drove in three runs. Pitt continued south to Miami, where it split a doubleheader at Florida International University. Game one was completely dominated by FIU. Rahach got the start and gave up six runs in less than three innings. Knight replaced Rahach in the third before giving up two more runs to seal FIU’s 8-0 run-rule victory. Game two resulted in another shutout, this time going Pitt’s way in a 2-0 victory. The only runs of the game resulted from an error by FIU. First-year infielder Hunter Levesque hit a high fly ball into right, which the right fielder dropped, allowing the two Pitt players on base to score. Pitt then headed to Boca Raton, Florida, where it went 2-3 in the Panthers Weekend Tournament March 8-11 after its matchups with FIU. Pitt took its first game of the tournament by defeating Ball State with a score of 6-1. The Panthers blasted four home runs in the game. Junior infielders Gabrielle Fredericks and Olivia Gray went yard along with Taylor and senior catcher Giorgiana Zeremenko. The Panthers faced Florida Atlantic in their second game of the tournament, tallying a dominant 7-1 victory. Senior pitcher Kayla Harris got the win, giving up one unearned run and five hits. The Panthers moved on to face Michigan in their third game of the tournament, where they fell to the Wolverines, 3-2. Pitt scored its first run thanks to an RBI double in the third from Zeremenko. The second came on a wild pitch, which allowed Levesque to score. In their penultimate game of the tournament, the Panthers scored four runs in the fifth inning to pull within one run thanks to a three-run homer by Levesque and a fly ball to left by Solak. But it wasn’t enough, as the Panthers fell to Rutgers by a score of 7-5. The Panthers finished the tournament with their third straight loss, losing 7-5 to Stony Brook. Pitt began to rally in the fifth after trailing 7-0. Myers and Gray each smacked RBI singles in the fifth as the Panthers put together a three-run rally in the seventh. The deficit proved too much, though, and they failed to finish the comeback. The Panthers are back at it when they return to North Carolina to play UNC in three games March 16-18.